Special Version of Carry-Bike for Laika Motorhomes. 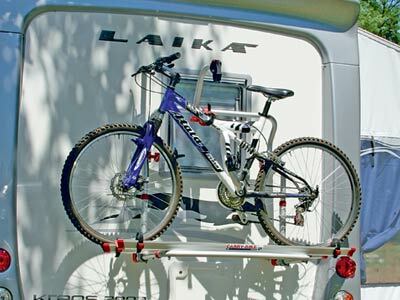 The Fiamma Carry-Bike L80 - Laika is a special version of Fiamma bike carrier Pro C with a wider 80 cm wheelbase, designed specifically for Laika motorhomes. Supplied as standard with: 2x Rail Quick (bike support), Bike-Block Pro 1 and 3 (frame to bike holder), 2x Rack Holders (secures the bike support when folded away) and Security Strip (buckled strap). Supplied as standard to carry 2-bikes but can also be purchased with additional Rail Quick supports and Bike Blocks to carry 3 and 4-bikes (see images above). 4th bike upgrade kit: 2x Rail Quick and 1x Bike Block Pro 2 and 4. Due to the wider 80 cm frame, it is safe to use Quick 140 Red and Rail Quick 200 red.